Israel and Jordan signed a peace treaty 1994 (Peace Treaty) – which has withstood many events that could have seen its termination. 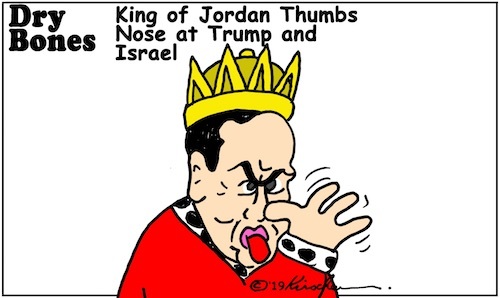 Jordan’s resistance to negotiating with Israel on Trump’s plan could see Trump shelving it and abruptly ending the 2018 five years $1.275 billion America–Jordan Memorandum of Understanding underpinning Jordan’s security and stability. 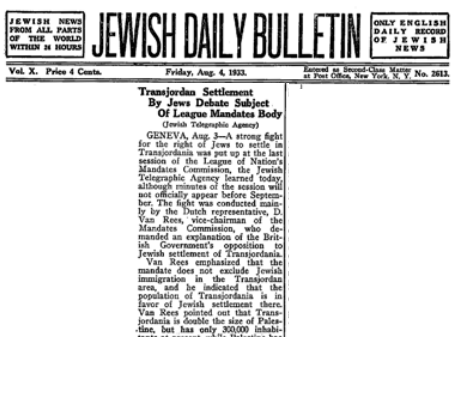 A strong fight for the right of Jews to settle in Transjordania was put up at the last session of the League of Nation’s Mandates Commission, the Jewish Telegraphic Agency learned today, although minutes of the session will not officially appear before September. 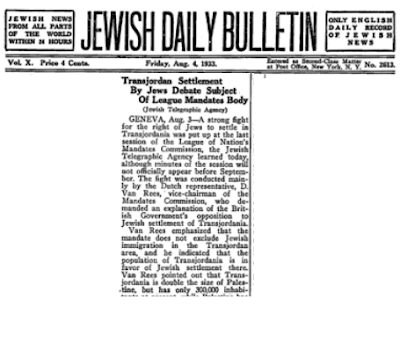 The fight was conducted mainly by the Dutch representative, D. Van Rees, vice-chairman of the Mandates Commission, who demanded an explanation of the British Government’s opposition to Jewish settlement of Transjordania. Van Rees emphasized that the mandate does not exclude Jewish immigration in the Transjordan area, and he indicated that the population of Transjordania is in favor of Jewish settlement there. Van Rees pointed out that Transjordania is double the size of Palestine, but has only 300,000 inhabitants at present, while Palestine has 1,000,000. “Besides, why prohibit sale of land there to Jews when the Emir Abdullah of Transjordania desires it?” he asked. He also pointed out that many Jews living in Palestine at present are not Palestinians, but are still subjects or citizens of countries belonging to the League of Nations. Considering the principle of equality for the citizens or subjects of all countries which are members of the League, it would be impossible to prevent these persons from settling in Transjordania, Van Rees stated. Netanyahu’s new declaration might work for election results, but at what cost? Some analysts say such a move would be irresponsible, and disastrous for Israel’s security, economy and diplomacy. Netanyahu has a history of making last-minute campaign pledges that, once elected, he retracts. Whether Netanyahu actually applies sovereignty in the next government depends on who will be his coalition partners, and how much push-back he receives from the Trump administration. It is more than likely that the right-wing parties with which he forms a coalition would demand West Bank sovereignty as a condition for joining that coalition. Annexing territory is a major issue that has vexed Israeli citizens and governments for 52 years: What to do with all the land captured in the Six Day War? Decisions and answers to that question should not be made on the fly during an election campaign, especially three days before elections. These are serious matters that require national debate and discourse. Let’s decide together, as a country, on such an important step. When it comes to New York Times coverage of Israel, literally anything goes. 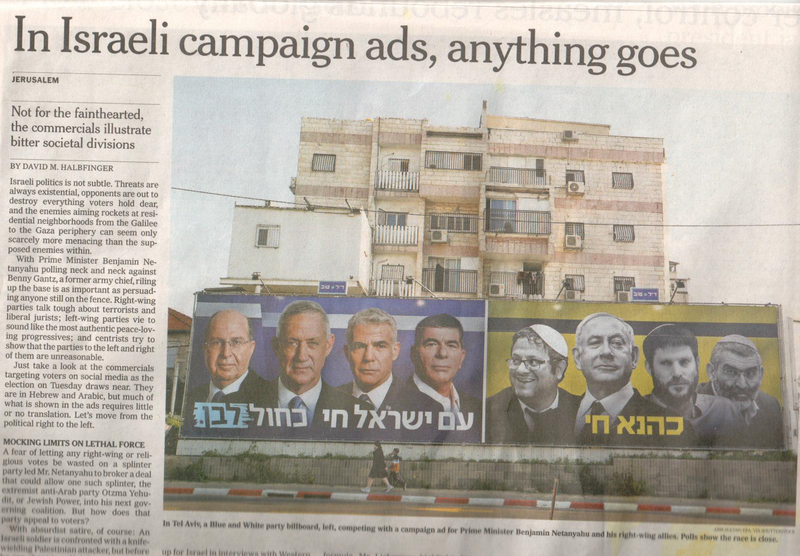 The latest case in point is yesterday’s completely bogus caption about an Israeli election billboard alongside an article meant to explain the various campaign commercials in the close and heated race. In Tel Aviv, a Blue and White party billboard, left competing with a campaign ad for Prime Minister Benjamin Netanyahu and his right-wing allies. Polls show the race is close. It sits below a four-column, top of the page color photograph of a billboard depicting, on the left side, the leadership of the challenging Blue and White party, from left: Moshe “Boogie” Yaalon, Benny Gantz, Yair Lapid and Gabi Ashkenazi. All but Lapid are former army chiefs; Lapid is a former finance minister. Their images are framed in blue and white and the slogan underneath states in white: “The nation of Israel lives Blue and White.” Immediately to the right are four more figures framed in yellow and gray. They are (from left) Itamar Ben-Gvir of the far-right Otzma Yehudit (Jewish Power) party, Prime Minister Benjamin Netanyahu, Betzalel Smotrich of the right-wing Jewish Home party, and Jewish Power’s Michael Ben Ari, whom the Supreme Court banned from running in the elections on the grounds of anti-Arab incitement. The slogan below these four men, in yellow, states, “Kahana Lives,” the rallying cry of the outlawed, extremist Kach party, banned from the Knesset in 1988 for inciting racism. A senior Jordanian politician has said Jordan hopes Israel’s national elections will produce a new government headed by someone other than Prime Minister Benjamin Netanyahu. Jordan is one of two Arab countries to maintain formal diplomatic relations with Israel. “Jordan hopes that after these elections, there will be a government led by someone other than Netanyahu, who knows that the only solution to the Palestinian issue is the establishment of a Palestinian state with Jerusalem as its capital,” Jordanian Senate Speaker Faisal al-Fayez told The Times of Israel over the weekend, on the margins of the World Economic Forum at the Dead Sea in Jordan. Jordanian King Abdullah has not made public comments about Israel’s upcoming elections. All of these considerations are absent — and still the UK and the EU are utterly befuddled. Yet, when it comes to resolving the Arab conflict against Israel, where every single one of the aforementioned challenges — and more — is thrust upon Israel by her part time interlocutors, the very same band of irredeemable European prognosticators unabashedly declares that on matters of the Jewish state, they know precisely what needs to be done. What a laughable, demonstrable double standard. In the context of Brexit’s relative simplicity, the UK and Europe plead the case of complexity, while in the context of Israel’s situational complexity, they plead the case of simplicity. Statements by the UK and the EU about what Israel should or should not do must now be viewed for what they are — nothing more than the bleating of a shepherd-less flock utterly oblivious to it’s own lack of direction. For too long, Europe has demanded of the state and people of Israel that we accept upon ourselves a standard that no other people would be so much as asked to consider. Now that they have been exposed as so woefully ill-equipped to deal with matters of their own future, perhaps we can be forgiven for rejecting the UK and EU’s counsel on matters pertaining to the sovereignty of the Jewish state. Their rhetoric should not be heeded. It should be ignored. The current tendency is to see the Gaza problem as originating in the refugee population that burgeoned there after the 1948 War of Independence. It would make more sense, though, to go back a few steps further and consider the city’s . . . geographic location as an intermediate station on the ancient highway between Asia and Africa [and] between Mesopotamia and Egypt. . . . It was the establishment of the state of Israel that blocked this ancient route, severed Egypt from the Arab east (mashriq), and turned Gaza into a cul-de-sac at the edge of Egyptian territory. The March 1979 Israeli-Egyptian peace treaty considerably exacerbated the Gaza problem. In a shrewd move, President Anwar Sadat shifted the Gaza problem exclusively to Israel’s purview. After the Israeli town of Yamit and neighboring villages had been razed and the Sinai in its entirety had been restored to Egyptian sovereignty all the way to the 1906 international border, Gaza could no longer develop westward into the potential open space between [the border city of] Rafah and [the nearest Egyptian city], el-Arish. . . .
Is it desirable for Israel to conquer Gaza and reimpose its rule, as in pre-Oslo days? If it is not, then Hamas’s military defeat requires an answer to the question of who should be given control of the Strip. Should Israel sacrifice its sons to serve Gaza on a silver platter to [the PA president] Mahmoud Abbas? It was, after all, Yasir Arafat, Abbas’s predecessor as PLO leader, who transformed Gaza into an ineradicable terrorist hotbed in flagrant violation of the Oslo Accords that he had signed. . . .
Border Police officers on Monday arrested an Israeli woman who was caught trying to smuggle a Palestinian man and an unlicensed pistol out of the West Bank in her car, officials said. While attempting to drive through the Reihan Crossing in the northern West Bank, the woman was stopped by security officials, who were acting on a tip, police said. A further search of the woman’s car uncovered a loaded pistol, which the woman had without the proper permit, police said. According to police, the gun appeared to have been stolen from a security guard for the Israel Nature and Parks Authority. The woman, a resident of Gan Hashomron in central Israel, and the Palestinian man were arrested. Palestinian Authority Prime Minister-designate Mohammad Shtayyeh will announce the makeup of his new government in the coming days, Palestinian officials said Monday. Five smaller factions will also join Fatah in the new government, officials said. Others, including the Popular Front for the Liberation of Palestine, refused to take part. Vets and volunteers from Four Paws International loaded some 40 animals and birds Sunday and headed to the Israeli border in the northern Gaza Strip en route to resettlement in Jordan and Africa. It marks the fourth and largest Gaza rescue mission by the Vienna-based organization since Israel and Egypt imposed a blockade on the Palestinian enclave in 2007. Israeli officials have long held that the Jewish state’s limitations on movement aim to prevent Hamas and other terror groups from transferring weapons into Gaza. In 2016, the last animals were evacuated from what had been dubbed at the time “the world’s worst” zoo in Khan Younis, also in southern Gaza. Some animals have died of cold and hunger in makeshift zoos as keepers failed to provide adequate care. Reentering the Iran nuclear deal and dropping U.S. sanctions, as some have recommended, will only increase the risks of Iran developing nuclear weapons. Should the United States rejoin the Iran nuclear deal and rescind reimposed U.S. sanctions? This course of action is being recommended by deal supporters, who want to reverse the Trump administration’s decision last year to unilaterally leave the Joint Comprehensive Plan of Action (JCPOA) and ramp up U.S. sanctions against Iran. Despite the U.S. decision, other parties have so far kept the deal intact. Deal supporters have expressed fears that Iran would walk away from the deal, but Iran has so far not done so and would suffer even worse economic sanctions and diplomatic isolation if it were to leave the deal. Notwithstanding good intentions, rejoining the deal without the necessary fixes to it would in essence bless Iran to enlarge its conventional, missile, and nuclear programs without receiving any commensurate concessions from Iran. All these increases will occur during the next administration, whoever wins the presidential election. Whatever one’s views of the Trump administration’s decision to no longer participate in the nuclear agreement, this approach will not address its flaws and the threat of Iran being able to build nuclear weapons. Rather than making this a partisan issue, a better option is to use the new leverage created by the reimposition of sanctions to build domestic and international consensus to fix the flaws in the deal during the next few years. The Democratic National Committee adopted a resolution that lauded the deal’s achievements and advocated for reentry. It did not urge any preconditions for a U.S. return. The statements urging rejoining typically contain notable mischaracterizations, such as asserting that the International Atomic Energy Agency (IAEA) stated Iranian “compliance” with the deal, something the IAEA has never certified in its quarterly safeguards reports. Moreover, each quarter since the deal has been implemented in January 2016, the IAEA has reported that it still has not been able to determine that Iran has no undeclared nuclear facilities and materials and thus cannot conclude that Iran’s nuclear program is peaceful. While Iran has been pressed successfully to stop its multiple technical violations of specific nuclear limitations, the basic proposition of whether Iran seeks nuclear weapons has not been answered in the three plus years since the deal commenced. Lebanese journalist Nadim Koteich said in an April 6, 2019 interview on Al-Jadeed/New TV (Lebanon) that he supports U.S. President Trump's foreign policies and that since he is not American or Israeli, he does not care about U.S. President Trump's domestic policies or if he is anti-woman or anti-gay, nor does he care that Israeli PM Benjamin Netanyahu's domestic policies are oppressive towards Palestinians. He said that as a Lebanese citizen, he cares most about Israel's policies vis-à-vis Iran. Koteich said that Iran is playing a destructive role in Lebanon and in the region. He added that Beirut and Lebanon are his top priorities and that for him, Beirut is more important than Jerusalem or the Golan Heights. He said: "Under no circumstances am I willing to pay the price for the Golan Heights." Koteich is a veteran journalist at Future TV (Lebanon).